Randy 'The Natural' Couture Breaks Down Past, Present & Future! Randy is one of the most knowledgeable and experienced MMA fighters and trainers in the world and has earned the respect of everyone ... Status Magazine breaks down everything that makes him a champion and much more! 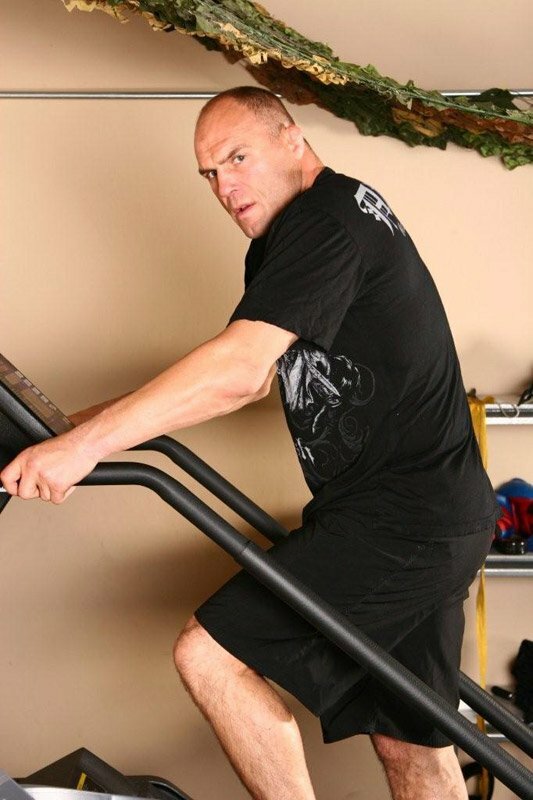 Quite possibly the most recognized figure in all of Mixed Martial Arts, UFC heavyweight champion Randy "The Natural" Couture has recently spent time in the movie business with two movies set to be released in April and one in August of 2008. 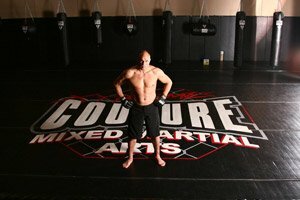 On top of his acting career, he has opened up a hugely successful Xtreme Couture gym in Las Vegas and has 4 more opening up in Florida, Washington, Chicago and Toronto. In fact, his gym in Las Vegas is so successful it has become a tourist attraction with fans of the sport from around the world dropping by just to get a glimpse of what it takes to be a champion. Status Fitness Magazine is giving you that opportunity: to learn from "The Natural" in this exclusive interview. 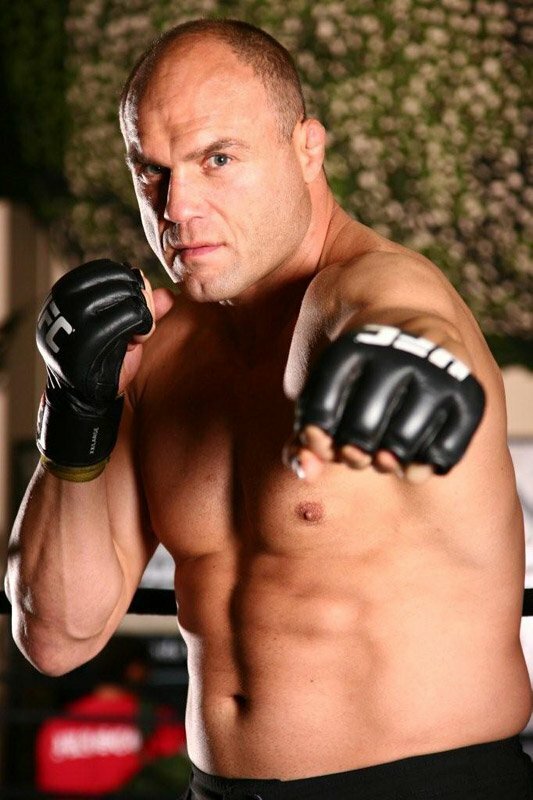 As one of the most knowledgeable and experienced MMA fighters and trainers in the world, he has earned the respect of everyone in the business and beyond. Successful Xtreme Couture Gym In Las Vegas. He sat down with "The Sushiboy" Arnold Lim and breaks down the training that makes him a champion, the nutrition that gives him the energy to be the best, and the supplementation that has put him over the top. 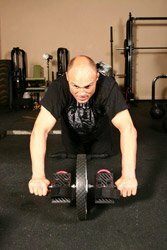 [ Q ] When preparing for a fight, do you primarily use your partners for conditioning with the rolling (grappling with training partners) aspect or do you still implement cardio equipment with continuous weight training sets? , are usually in the evenings. So they are completely different situations; the machines, the boxes and the balls and all that stuff is more of a morning workout situation. We will use partners for some of the "situations" stuff and the mitt work. Obviously you need someone to hold the mitts for you. The strength and conditioning is kind of a separate workout - you don't really need anyone else unless you have the luxury of a strength coach who is going to put you through those workouts. Now some of the calisthenics, some of the situations we did incorporate into the circuit, we use a partner. I would get a partner and push him across the ring for a minute straight, and then he would try to push me across the ring and I would resist for a minute straight. We would do a whole round of that, back and forth for a minute - which requires a partner. Some Of My Training Does Require A Partner. against bungee cords or punch with someone holding me back with a bungee cord harness, which again requires a partner or two partners to do those routines. It just depends on the situation. [ Q ] Is that what you use as cardio to mimic a fight round? in between rounds, just like you have in a fight. You try to get through at least five rounds - in my case; championship fights. You get five or six rounds of whatever your routine is. I do my sprint routines that way and break down my cardio circuit in a similar fashion. So you kind of get into the mentality of finishing a round strong, recovering in a certain amount of time and then doing another round, or as many rounds as you need to go. 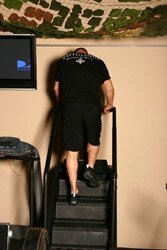 [ Q ] Do you use any equipment for cardio? on the asphalt or outside. I used to do a lot of public training on the track when I was younger, but it is just too hard on the joints. Stairmaster & An Aerodyne Bike. [ Q ] What type of weight training do you do and is it different if you are fighting at light-heavyweight as opposed to heavyweight - which you have done both of? over the years. I wasn't really interested in doing the heavyweights. I didn't feel like getting any bigger or stronger was going to help me win fights. I was more interested in having endurance and durability from doing circuit training, so I focused on that a lot. That routine has modified over the years, but has been pretty much the same from the start. Some core lifts, some squatting and lunging and Olympic lifting incorporated into the circuit. For this last training cycle for (Gabriel) Gonzaga I had the option of working with a personal trainer, which I had never really done before. I had always kind of done it myself. So that was nice to have somebody else running the show and just showing up doing what he had on the schedule for that day. We incorporated all the different pieces of what I had been doing on different days into one routine. (We) did that a couple of times a week, which freed me up on those other days to focus more on technique and focus mitts and getting in more situation drills and things that are more technical to fighting. I Focus On Endurance & Durability. training for conditioning. Nothing we do in fighting is long and slow, everything is short bursts of explosive energy, which is much more in line with sprinting than it is anything else. [ Q ] Would you be doing that again (having a personal trainer) for future fights?
. So we will just have to wait and see what happens. [ Q ] When training with weights, does your training flow from one exercise into the next? The weight training is incorporated into the circuit and definitely goes from one exercise to the next - a lot of it is core strength oriented, higher repetitions with lighter weights. 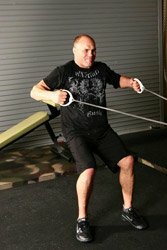 [ Q ] Many feel that pulling exercises are utilized in MMA a lot, but when you are fighting a big guy, are the pushing exercises equally as important? I think there has to be a balance. I think we incorporate both pushing and pulling - when you are throwing punches those are more pushing muscles. There are situations where you are pushing a lot, but you do use a lot of pulling muscles for takedowns and pulling muscles in the clinch, so I think there has to be a balance. I don't think you can work one area over the other and maintain that. [ Q ] Do you prefer training in controlled environments such as a gym / MMA center like Xtreme Couture, or is outdoor training commonly incorporated? on the trails just to get out and get a break from the normal grind, but most of the training is done specifically for fights, in the fight environment. [ Q ] The future generation of fighter is more complete these days. How does it make you feel to know you can give back to the sport that has made you a household name? It is satisfying for me to be involved in the sport and see the fighters that have helped me so much in the training environment thrive and be able to coach them and be there to support them and give back to them. In turn, I think that continues to foster the sport and see the sport grow. (We are) creating these little centers, these little pockets of fighters with the same attitude, all around the country and now we are going international too, with Canada opening up. Actually, we had some interest in England and some other places as well ... I know the sport is not going anywhere and it is going to continue to grow and establish this foundation that is already there. [ Q ] How important is having a great team around you - would you be the fighter you are today if you didn't have some of those people around? and the people I have rubbed elbows with over the years. I have learned a lot from a lot of different guys. I think that you are really only as strong and good as your workout partners. They are a very, very important piece of the puzzle; they can take you out of fights and they can put you in the right frame of mind and give you the right skill sets to win fights. I think that one of the most important pieces to training and preparing for fights is your team. [ Q ] For any given fight you would adjust your training according to your opponent's strengths. For general training, do you spread your training equally over standup and grappling? small gloves and MMA situations. There is one day a week where we do shark bait: you get in there and you tie yourself on tight, you have guys ganging up on you and you are being pushed to the limit - it is as close to live fighting as you are going to get. We definitely mix it up and adjust those workouts for the individuals that have specific fights and specific opponents coming up. In those situations those guys have to be a little more selfish and a little more specific about the things that they are doing, so we make the adjustments necessary to make sure the guys that have big fights coming up get what they need. [ Q ] How important is bungee cord training? It is something that we were using with the National Team with wrestling for conditioning and penetrations where you are changing levels with resistance. If you are out of balance and not doing it right, it is going to show against that resistance of the bungee cord. It helps build some core strength and some speed, so it is something that I took from wrestling and incorporated into fight situations and fighting; it is something that I like. Helps Build Strength & Speed. [ Q ] Medicine balls have been in martial arts training for a number of years; do you feel that they are still relevant today with all the modern technologies? over the medicine ball, scrunch ups with the medicine ball, chest passes to a sprawl and back and forth. We do a lot of things with medicine balls; they are a pretty good piece of utility equipment. [ Q ] Can you explain to readers what a "shark bait" drill is. Shark bait is a drill where one fighter stays out in the center of the ring or cage. A new fighter rotates in on him every minute for 5-minute rounds. Then you get your minute break and get back out there - you are dealing with a fresh opponent every minute of every round. It pushes you to the max, obviously you get tired. You have to operate when you are tired and you have to keep your wits and survive. It is not only a conditioning tool, but also a psychological tool. You learn how far you can go. Bad habits and technique fall apart when you get tired. You've got coaches there to help you get through those rounds, especially the later rounds where it gets very, very difficult. [ Q ] You strive to maintain an alkaline state - minimizing the acidity in the body through eating natural foods. Comparing these more "natural" eating habits to "normal" eating, how does your body feel and recover? Is there a difference? Using a greens supplement, of all the supplements I have used over the years, I really noticed a difference with the increase in alkalinity and dealing with the acidity that builds up in your body. It became a real big factor when I was cutting down to 205 lbs. The last thing you want to do in cutting weight is lose a bunch of strength. Changing my eating habits that way allowed me to drop the excess body fat and maintain the strength and power that I had. Now that I am back up at heavyweight, I put some of that mass back on. I think I am leaner now at heavyweight than I was when I originally fought at heavyweight. My body looks a lot different; my body composition is a lot different and I think that is attributed to the diet. [ Q ] Tell us about your line of supplements. is more of an athletic based line of supplements that came out about a year ago. The greens are kind of the centerpiece of the line. We have things that I always wanted to use or have used over the years to get me through training or help me recover from training. That is where the line came from. It just came out of seeing a need of what I needed as an athlete. Not based in bodybuilding or from any other perspective that many other nutrition companies are coming from. It is truly an athletic based line. [ Q ] Do you personally utilize protein powders, glutamine and multivitamins regularly? proteins, or soy milk ... instead of regular dairy. [ Q ] Do you take any supplements to aid in muscle recovery, additional endurance or energy? line is designed for that: buffered creatine or Acai in our replacement energy drink. [ Q ] How many meals a day do you eat and at what times of the day? I get so damn busy. I get up and eat a pre-workout snack that is pretty light: a banana and a drink and I will have oatmeal or eggs after the morning workout. I will have another snack before the afternoon workout and I will usually have a bar and a big drink after the big workout ... and then have dinner later. Sometimes I Foget To Eat. [ Q ] What does your pre-training and post-training meals consist of? grams, measure food and all that cr@p - that will last about a week with me. I know what good food is and I know what bad food is. I know what is good for me. Stay away from sugars and processed foods; try to eat good whole foods. You can pretty much eat as much as you want of those kinds of foods. I try to keep it simple. [ Q ] Do you consume fluids during your intense training to keep the body in a positive electrolyte state? , but I sometimes don't take the time to do that during training sessions. I don't have time - we don't take breaks. [ Q ] How closely do you monitor your body's responses? I know my body pretty well. I know that I will lose between 7-9 pounds of water in a good workout if it lasts an hour, hour and a half, two hours. I know it is going to probably take at least that long to re-hydrate and to put it back in. After practice my body gets pretty used to that cycle: dumping water and putting it back in. I don't normally stay around in that dehydrated state for long. Usually as soon as practice is over I have water right there and I start to put the water back in. I can tell - I start to get shaky if I forgot to eat; I kind of get that sense that I need to put some food in the tank. [ Q ] Do you commonly use chiropractors, massage or acupuncture? and fighting career. I have had access to all three ... adjustments, acupressure, energy system stuff, kind of an amalgamation of eastern and western medicine - it is pretty interesting stuff. But over the years I have used acupuncturist ... I have used a lot of masseuses. [ Q ] Do you spend time in infrared saunas, steam rooms or regular saunas? I like steam rooms; we used to train at a gym that had one ... we don't have one in our gym. It hasn't been a regular part of things. I have used saunas and steam rooms over the years for recreation and relaxation, but it is not something I like to use to cut weight. [ Q ] How about infrared saunas? I don't know if I have ever been in one. An infrared sauna is a sauna that heats its occupants with heaters that emit far infrared radiant heat. Infrared saunas do not use steam, (which heats the air, and thereby the user) but instead use infrared radiation to directly heat the user. [ Q ] When you are recovering from weight cutting, do you drink water by gulping it down right away or do you drink it really slowly. It depends on how much I cut. Usually everybody wants to drink ice-cold water, but it is going to really knot up your stomach. You want to drink water at room temperature and you want to sip it slowly - you don't want to guzzle it. It is going to make your stomach sick and a lot of times that you do that you are just going to throw it back up. [ Q ] Is there any chance we will ever see you cut weight to light-heavyweight (205 lbs) again? I don't think so; I am pretty comfortable being a heavyweight. I think the bigger guys pose some interesting problems. I have enjoyed competing back at the heavyweight division. I suppose in the right situation I could make LHW again; I am no bigger than I ever was. I am pretty comfortable where I am at. Frankly, at 44 I don't have a whole lot of years of fighting left in me. I am looking for 1 or 2 more good fun fights and we will see what happens. [ Q ] Let's talk a little bit about your career - there has been a pretty public dispute between you and Mr. White of the UFC. You fought most of your career in the UFC - I can't even imagine you not fighting in the UFC. Is that a realistic possibility that you will never fight in the UFC again? [ Q ] I have spoken to you about it, but to hear you say that yourself ... it is jarring; do you feel that way yourself? Could you have imagined this day? response is telling me that it is probably not going to change - at least not by them. I think they feel they rescued the sport and built it to where it is today. In some ways that is absolutely true. That doesn't mean that they are doing things the way that they should be done. The fighters aren't getting the treatment they deserve as this sport explodes. We will see what happens. There are still negotiations on the table and things happening in my career and without jeopardizing those, at this stage of things, I can't really say a whole lot. I am perfectly content to walk away from the UFC and MMA as a fighter right now and go out on top - moving forward with all the other things my gyms and the other things I have going on. That is a very real possibility at this point, especially with the reaction that the UFC has given me so far. [ Q ] Is there any chance that it can be repaired? I don't see the UFC willing to step up and make that fight happen at this point. If that fight is not going to happen in the UFC, I am absolutely done fighting for the UFC. If the UFC is willing to step up and make that fight happen, then I will be glad to fight for them again. [ Q ] How about light heavyweight; would you fight Quinton Jackson for the title? [ Q ] Are there any parting thoughts for the Couture fans out there? I appreciate everybody's support in retirement, coming back and fighting again, winning championships, whether I am up, down, or all around. The fans have been very true to me and their support has been fantastic, I appreciate that. I know things have been difficult and kind of confusing ... it is all going to settle out and it will be fine. Everybody has stuck with me and I really appreciate that; outside of what Dana (White) has tried to paint, in their perspective, hasn't really always been about money or any of those things. It is more about principle and integrity. I have done my best to let my actions speak louder than my words and maintaining the integrity that people are used to me demonstrating. I am going to continue to do that. Couture currently has 2 movies set to film next year: "Mandrake," which will film in China, and a new science fiction movie called "War" that starts filming in April. Set to be released in theatres that same month include "Big Stan," with Rob Schneider, and "Red Belt." Due in August of 2008 is "The Scorpion King: The Akkadian," a prequel to "The Scorpion King," where Couture plays the villain in his first leading Hollywood role. For more information on Randy Couture, Couture Nutrition, Xtreme Couture gym and more, check out Xtremecouture.tv.